Sit Upons Provide A Convenient, Clean Place To Sit For Your Young Students. The 1" Thick, Soft Foam, Square Cushions Are Covered In Vinyl For Easy Cleaning. Each Set Includes Six Sit Upons With Two Of Each Color: Red, Yellow, Blue. Each Has A Handle For Carrying.. Sit Upons Provide A Convenient, Clean Place To Sit For Your Young Students. The 1" Thick, Soft Foam, Square Cushions Are Covered In Vinyl For Easy Cleaning. 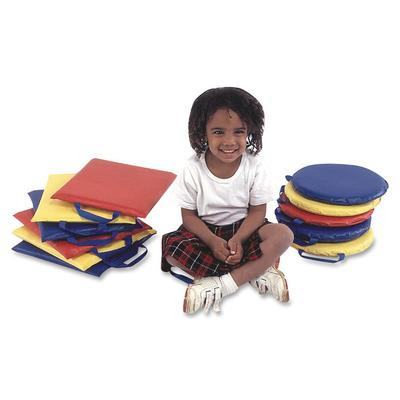 Each Set Includes Six Sit Upons With Two Of Each Color: Red, Yellow, Blue. Each Has A Handle For Carrying.